Analysis of Variance (ANOVA) is a widely used statistical technique in clinical research, pharmacology, psychology, molecular medicine, and other fields of experimental science for analysing data. ANOVA can be used to determine if there is a statistically significant difference between the means of groups, due to some influence factor. In graphs and in figures, statistical significance is typically expressed using asterisks (*) and sometimes, authors also state the significance level (α). In the context of ANOVA, an influence factor is an independent treatment variable that an experimenter can control and/or vary, which may or may not result in significant differences in means. Examples of possible factors include temperature, solvent polarity, catalyst, location, method of analysis, diet or drug treatments. Alternative Hypothesis (H1): There is a significance difference in the means due to a factor. One-Way ANOVA is also referred to as unifactor ANOVA or single factor ANOVA. The calculation of the F-statistic, which is simply the ratio of the variation between sample means to the variation within the samples, is the basis of ANOVA calculations. The higher this ratio, the weaker the evidence supporting H0. 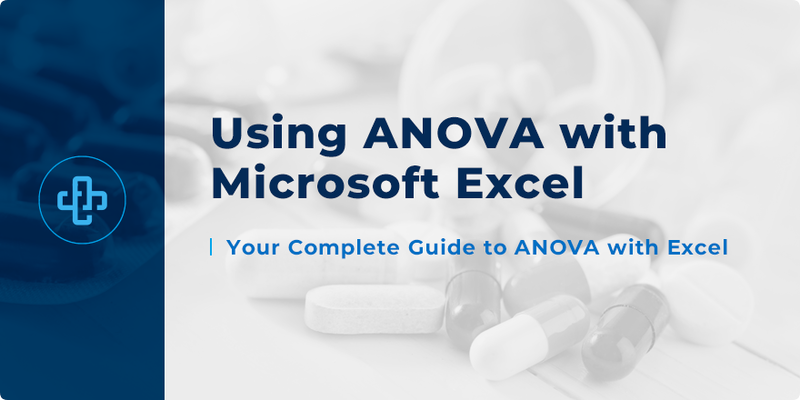 In this article, we will show you how to do one-way ANOVA calculations on Microsoft Excel. Why are multiple t-tests not recommended? The t-test is a robust test for detecting a statistical difference in means between two populations that are normally distributed. When you are analysing more than two groups, it is strongly recommended to analyse your data using ANOVA instead. Using multiple t-tests increases the chances of making a Type I error (incorrect rejection of a true H0!). What if there is more than one factor? Research questions are often complex and typically involve more than one factor. 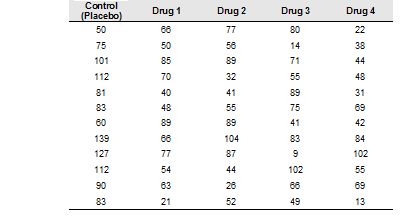 Suppose a biochemist wants to look at the influence of stirring speed and temperature on the outcome of an assay or if a pharmacology researcher wants to determine if there is an interaction between an experimental drug treatment and gender on cytochrome P450 activity. In both scenarios, you have two factors (example 1: stirring speed and temperature & example 2: drug treatment and gender). In such scenarios, you would need to perform multifactor ANOVA (AKA multiway ANOVA) to analyse your data. 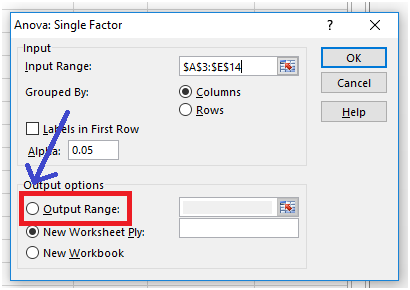 You can also do Two-Way ANOVA calculations using Microsoft Excel’s “Data Analysis” but not Three-Way or greater. 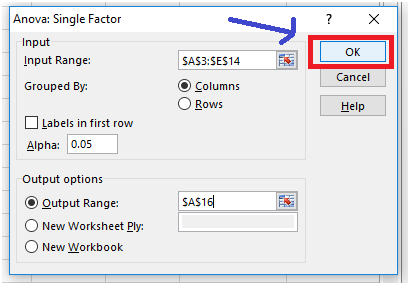 How do I do One-Way ANOVA calculations with Microsoft Excel? 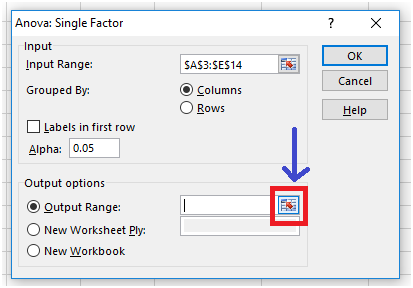 Although the example below uses Excel 2013, other versions of Excel work in a similar fashion. 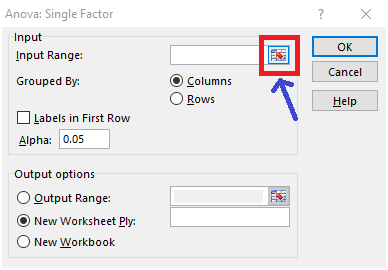 Step 1: Enable “Data Analysis” on Excel. If it’s already enabled, you can skip Step 1. Step 5: Highlight your data, starting at the top left corner and ending at the bottom right corner of your data as shown below. Exclude the labels. The default setting is “Alpha: 0.05”. Since α = 0.05, we will leave the “Alpha:” box as it is. Step 9: Choose an empty cell on your spreadsheet. 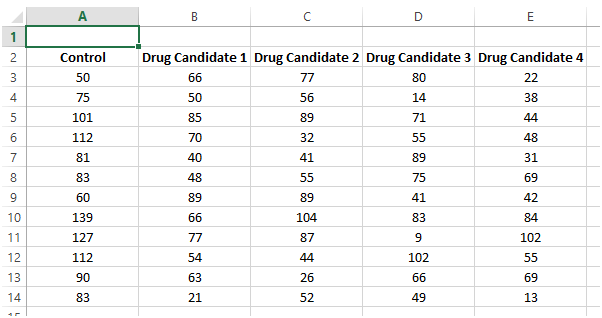 Bear in mind that Excel will generate the results on a 7×17 area so an area of that size to the bottom right of your chosen cell must also be empty. Our p-value is 0.00281. 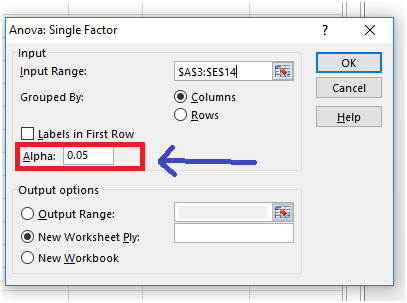 Excel also shows you the F-statistic. You performed the test at a significance level (α) of 0.05. If you obtain a p-value greater than 0.05, that means there is no statistically significant difference between the means due to a factor. 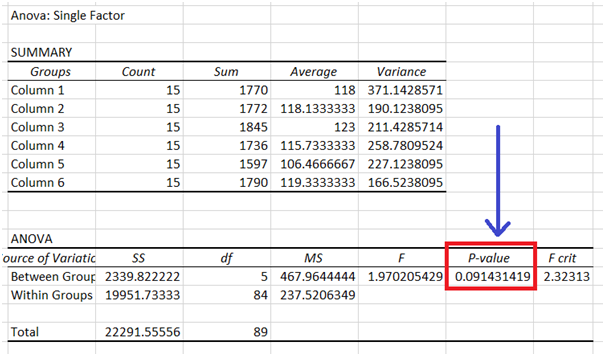 However, in the example shown above, we obtained a p-value of 0.00281, which is lower than 0.05, meaning there is a statistically significant difference (we reject H0!). Since p ≤ 0.05, we have strong statistical evidence that the factor (treatment) has an effect (concentration of NO in rat plasma) that is likely not due to chance and we may reject H0. We may also state that since p ≤ 0.05, there is a statistically significant difference in the mean concentrations of NO in rat plasma due to the drug treatments (we accept H1!). Several groups of healthy male Struthio camelus (n = 15 per group, age = 25 years old) were subjected to special diets for a month to investigate the effects on body mass (kg). Determine, at a significance level of 0.05, if the special diets resulted in a significant change in body mass. You performed the test at a significance level (α) of 0.05 and we obtained p = 0.0914. Since p is greater than 0.05, our evidence for rejecting H0 is weak. You can conclude that there is no statistically significant difference in mean body mass of the groups of Struthio camelus due to their diet (we accept H0!). 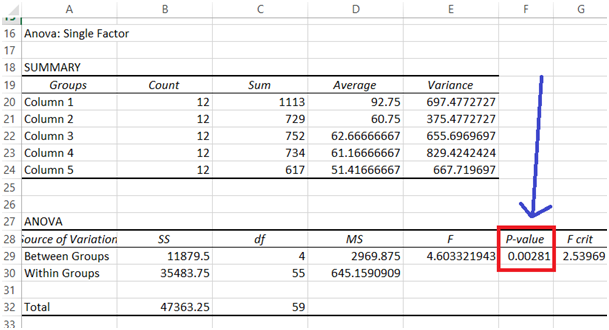 When doing ANOVA, how do I find out where the differences in means lie? ANOVA is an omnibus test, meaning ANOVA tests for an overall experimental effect. ANOVA can tell you that there is a difference between the groups due to a factor but it won’t tell you where the differences are. Tests referred to as post hoc tests such as Dunnett’s test can be used to tell you where the differences lie. Other software packages such as SPSS and GraphPad PRISM can perform post hoc tests.